With two common household items that you’d normally just throw away, you can create a simple firestarter perfect for camping trips! Stuff each roll with dryer lint. Toss a roll into the fire pit, underneath several pieces of wood (and newspaper, if you have it). Carefully light it and stoke the fire gently until it catches. Not only are you re-purposing items that would be otherwise destined for the landfill, but these firestarters are essentially weightless, so you can avoid lugging around extra gear. To keep them dry, store them in a re-sealable plastic bag so they are good to go when you are. ROYALE® Tiger Towel® paper towel is compostable! Find out how you can use it in your garden. 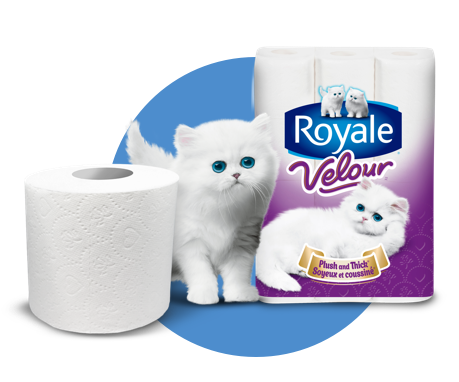 To get more tips (and a coupon to try VelourTM today) subscribe to our ROYALE® emails. By subscribing to our emails, you’ll stay up-to-date on savings and contests, get personalized tips, and more! Yes, I would like to join the Moment with ROYALE® online community to receive emails about exciting news, rewards and savings from the ROYALE® family of household paper products. Membership is absolutely FREE, and you can unsubscribe at any time.